It was the real thing: from the peaks of pride to the lowlands of humiliation: only to rise up again clad in the mantle of grace: Viva Nabucco indeed. Nabucco triumphed at the Teatru Astra: La prima was an integral artistic experience: nothing left to chance or the spur of the moment: every detail meticulously and rigorously planned and superbly executed by one and all. It was a production to grace the finest and the most prestigious of boards anywhere in the world: from Tokyo to New York. 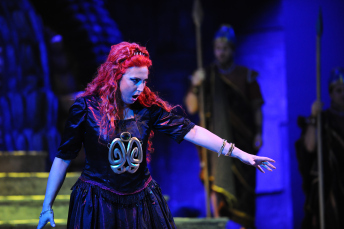 By now connoisseurs and patrons have come to expect no less of the Teatru Astra when it comes to Opera. This time around the fondest expectations were not only met but surpassed. It was not an easy task: after the bombshell of Otello, teeming as it was with intrigue and bristling with action and sounding the depths of human emotion, one may have thought that Opera in Gozo had reached its definite peak. At the Teatru Astra it is not the solitary peak but a range of peaks….. frankly, it could not be otherwise: the Teatru Astra has amassed a tremendous arsenal of fire-power which can easily take on any challenge. Thursday’s packed auditorium can attest to this. It was standing room only: that’s also the case with this evening’s production. One can rightfully surmise that with La Boheme the coming year, the 3rd evening would not be enough to meet the demand. As the saying goes, “nothing succeeds like success”….The writing was on the wall, indeed: the electrifying Chorus coached by the highly respected Maria Frendo; the stellar cast led by the magnetic Carlo Colombara (Zaccaria) and featuring finely-nuanced Piero Terranova (Nabucco), the mesmerizing Silvia dalla Benetta (Abigaille) – the revelation of the evening -, the sophisticated Olga Sliepnova (Fenena) and the dashing Cliff Zammit Stevens (Ismael); and the supporting roles very ably interpreted by Dorienne Portelli (Anna), Louis Andrew Cassar(High Priest of Baal) and Mario Portelli (Abdallo), the flowing grace of the corps du ballet spearheaded by Natalie Sciortino; the mesmerizing mise-en-scene, the brainchild of brilliant artistic director Enrico Stinchelli realised by the resident outstanding scenic artist Joseph Cauchi aided by Andrew Portelli and his stupendous team ; the wondrous play of lights and the timely projections expertly handled by Ismael Portelli and George Zammit; the stunning costumes provided by Arrigo Costumi and coordinated by George Farrugia and Manwel Grima; the backstage dedicated group handled by production assistant George Camilleri, the experienced Carmel Zammit, stage manager, and operations manager Bradley Xuereb; and the unequalled bravura of Joseph Vella at the helm of Malta Philharmonic Orchestra and all the forces at his disposal. Teatru Astra, home to the La Stella Philharmonic Society, is committed to further the excellence which is its defining characteristic. 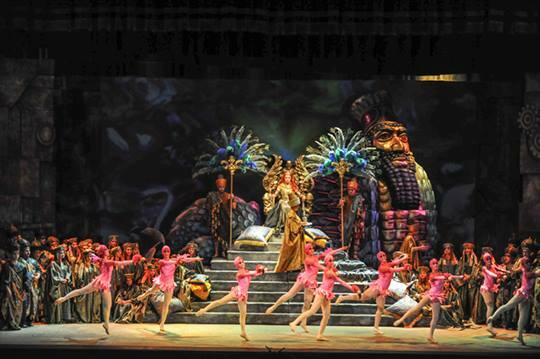 At the Teatru Astra the gilded past and the shining present are the sure guarantee of a golden future.